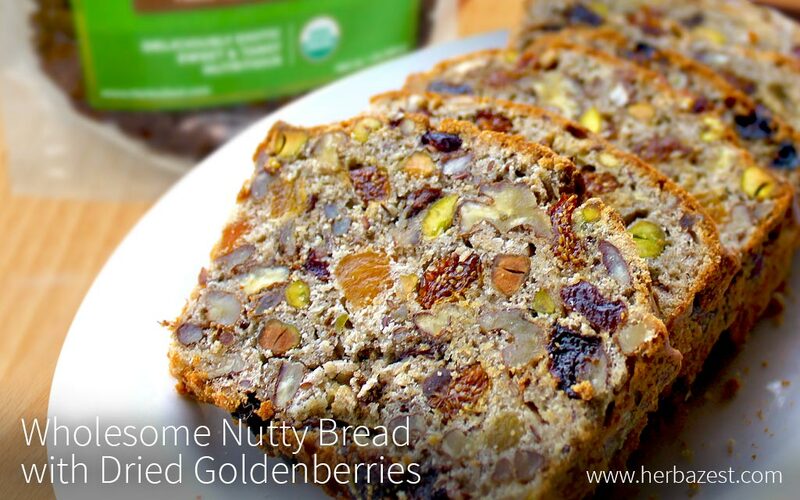 This flavorful bread is so good that it can be eaten on its own! It contains a colorful variety of nuts and dried fruits, all of which add a natural sweetness and a richness of nutrients along with lots of dietary fiber. Pecans and pistachios are rich in unsaturated fat, which is helpful in reducing bad cholesterol, thus improving heart health. Dried goldenberries have a pleasantly tart flavor and are a powerful weapon against diabetes and inflammation. Dried cranberries are famous for their role in maintaining healthy kidneys, while apricots are known for their high beta carotene content. Let it cool completely before slicing. Enjoy it with butter, jam, or on its own! The beauty of this recipe is that it can be easily customized. The idea is to add two cups of dried fruits and two cups of nuts of whatever variety you currently have on hand. Some other great ingredients to add are dried figs, dates, papaya, or mango as well as walnuts, hazelnuts, or cashews.